Your knee joint is made up of the ends of the thigh bone (femur) and shin bone (tibia), which normally glide over each other smoothly because they are covered by smooth articular cartilage. 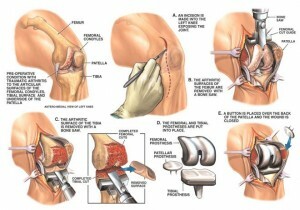 The joint is held in place by ligaments and covered at the front by the patella (kneecap). If the cartilage is damaged by injury or worn away by arthritis for example, the ends of the bones can rub together, causing pain and restricting movement. 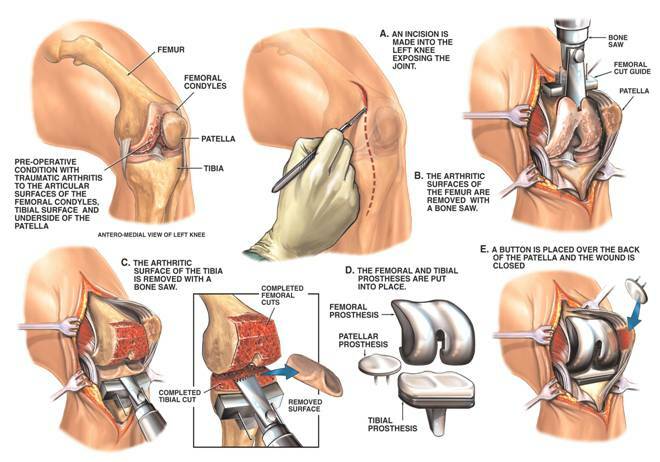 The operation involves removing the damaged surfaces of the knee and replacing them with an artificial joint containing metal and plastic component. It is an extremely successful operation for the vast majority of people. The aim is to replace a knee joint that is painful, stiff and often deformed with one that is pain-free, moves easily and is correctly aligned. You will have a general anaesthetic, or occasionally for medical reasons, a regional (spinal anaesthetic) and sedation. The operation will take between 1 and 2 hours. A long cut, usually over the front of your knee is made. The bottom end of your thighbone is trimmed to remove the damaged surface and is then shaped to fit the metal bit of the knee replacement. The damaged top end of your shin bone is removed to make a flat surface. The new parts are fitted over both bones, and tested to make sure they fit and the joint works well. Once the new parts are fitted and working the wound will be closed using stitches or clips, then cover it with a large dressing. You may need a blood transfusion due to blood loss during the operation. Immediately after the operation you will be transferred to the recovery room where you will remain until Professor Haddad and the anaesthetist are satisfied that you have recovered sufficiently before you are transferred back to the ward. A drip, (a fine tube) inserted into a vein in your arm that supplies fluids or blood. A bulky dressing around the knee and a drain to remove any fluid build up around the knee. One or two drains (small tubes) may be used to drain away fluids and reduce swelling around the operation site. These are usually removed after 24 hours. Good pain relief is important and some people need more pain relief than others. Pain relief can be increased, given more often, or given in different combinations. Please ask help from the nurses on the ward if you are in any discomfort. A physiotherapist will visit you pre-surgery, and on the day after your surgery and begin teaching you how to use your new knee. If necessary, you may be fitted with a continuous passive motion (CPM) machine that will slowly and smoothly straighten and bend your knee. You will have post-operative Xrays. Most patients just need a stick by the time they are ready to go home 3-5 days later. You can expect some pain but not the same sort of pain as you had before the operation. The time it lasts will vary from a few days, to several weeks; everyone is different. It is important to take your painkillers as advised. Swelling and bruising may take up to 6-8 weeks to disappear; for some it can last up to 6 months. The dissolving stitches and paper strips (steri- strips) closing your wound, can normally be peeled off 14 days after the operation. One of Professor Haddad’s nurses will keep in touch with you by phone and a follow-up appointment 6 weeks after surgery will have been booked prior to your operation. After your stitches and steri-strips have been removed you can have a shower or bath once we have shown you how to use it safely. Until then your wound will need to stay covered with a waterproof dressing. When in bed, take care not to remain in one position for too long to prevent your heels, ankles or back getting sore; change your position every one to two hours. Try to gradually increase your activity each day by walking as well as continuing your exercises. You must not drive or resume any sporting or gardening activities until you have seen Professor Haddad and he has cleared you to do so. Anaesthetic – Modern anaesthetics are generally very safe. The anaesthetist will explain any particular risks to you. Infection – There is a small risk of infection of the joint following the operation but you will be given antibiotics to help prevent this. If after you get home you notice fever, increased pain, swelling and redness around the wound, please phone contact our office. Deep vein thrombosis (a blood clot in a leg vein) – You may have anti- coagulant medication and support stockings to help prevent it. A symptom of this may be an acute pain in your calf. Please contact us urgently. 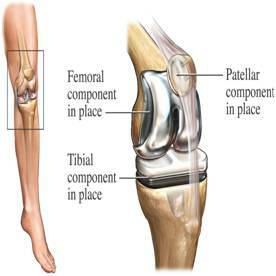 Loosening – Your new knee may become loose with time or eventually wear out and need to be replaced. 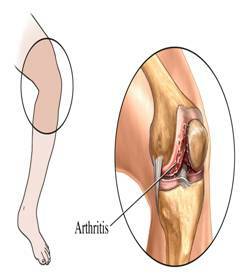 Numbness – there is typically numbness on the outer side of the knee. This relates to the small skin nerves that have to be cut during the operation. Some of this numbness, but not all, will recover. It should not stop you from kneeling if you wish to kneel. All patients will need a full blood count on day 1 and again days 4 and 7 if still in Hospital for thrombocytopenia although the incidents of HIT with low dose prophylaxis seems to be much lower than initially feared. It is generally accepted that uni-compartmental and knee replacements should be kept under surveillance so that potential problems are identified at an early stage. The knee review programme has been established to monitor the performance of your artificial knee.